With average annual investments in Fintech surpassing $17B, competition in banking has never been more fierce. Bolstered by the success of companies like Venmo and Wealthfront, consumers are increasingly comfortable with more disruptive banking solutions. In fact, a majority of US and UK consumers trust companies like PayPal and Amazon nearly as much as they trust the banks with money. In addition to facing competition from tech companies, banks are facing competition from retailers. Accenture predicts that 20 percent of traditional bank revenues will be lost to retailers by 2020 as companies that already sell payment services, credit cards and loans -- like Amazon and Alibaba -- are poised and primed to offer competing services. With the competition showing no signs of slowing, banks must get focused in order to keep market share. Here are some investments banks can make now to stay relevant. When it comes to banking, time is money. And the more time customers save, the better. Consider this: in countries where banking is more time-consuming and cumbersome -- like Mexico and India, up to 90% of consumers are open to running their finances through a major tech firm instead of a bank. But banks in countries like the Netherlands -- that have digitized routine transactions -- banks are better protected against disruption. Consumers increasingly expect every transaction, including transferring money to a friend, requesting a loan, or applying for a credit card, to be fast and mobile, and it’s no wonder that Banks like J.P. Morgan Chase have had huge success through mobile applications. But in addition to having a clearly defined digital and mobile strategy, banks should prioritize investments in branch automation. By automating routine aspects of banking -- like credit card application processing, basic question response, and administration, customers can move more quickly through basic transactions. 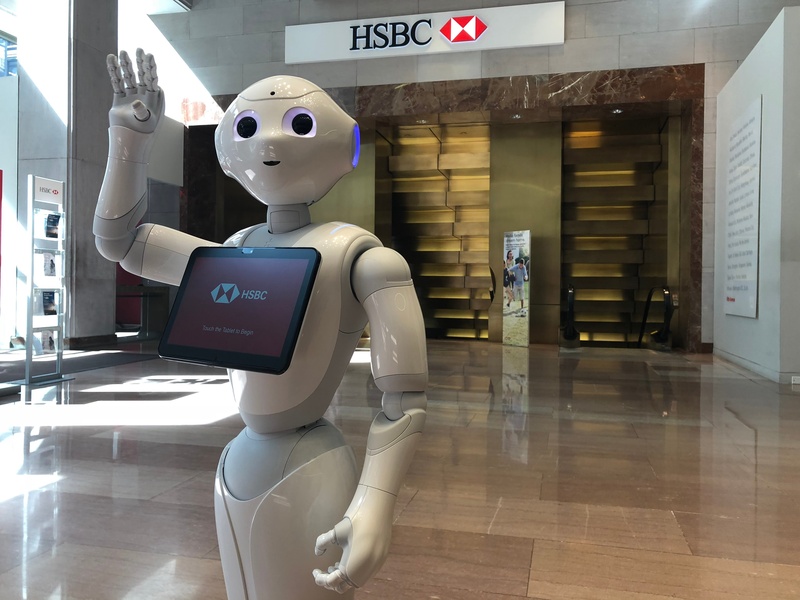 One leading innovator, HSBC, uses Pepper, the humanoid from SoftBank to greet customers, answer questions, educate customers about banking products and services, and automate Tier II and III transactions. Since the bank launched Pepper, they have seen higher customer volumes, decreased wait times, and increased morale in the bank, as employees have taken full advantage of the automated activities to spend more time engaging with customers. Banks are increasingly facing the same challenge as big box retailers -- competition from Amazon and other low-cost, digital natives. And like big box retailers, banks are finding that the best way to compete with Amazon is through a superior customer experience. In retail companies, CMOs are doubling down on investments in CX, and making customer experience a top marketing priority. Banks should take a lesson out of this playbook, and realign branch strategy to better support impactful, memorable customer experiences. One place banks can really differentiate is through the branch. Too many banks have neglected investments in people and real estate, favoring digital strategies over brick and mortar, but as banks seek to attract the next generation of bankers, investments in the branch should not be overlooked. Millennials are known for investing in experience over stuff, and are loyal to brands that can deliver a better experience. The branch provides an opportunity for banks to do just that. By prioritizing staff training, upleveling staff skills, and investing in technology, services, and experiences (such as financial literacy classes) at the branch, banks can attract new customers through memorable experiences. Today’s data-rich universe makes it possible to get a sense of each customer’s banking goals and needs at a 1-1 level. Unfortunately, too many banks aren’t taking advantage of their access to big data to drive the personalization that is needed to keep and grow customer relationships. There is true value in understanding customers as individuals -- and delivering personalized offers that align with their current life needs and goals. Bankers that can find ways to better know their customers, track their behavior -- online and offline -- are poised to market the appropriate products at the appropriate time, and capture market share. Personalization is a key step toward gaining customer loyalty and trust. If you don’t anticipate your customer’s needs, your competitor will. In fact, 42% of bank defectors bought from the competition because they received the right offer at the right time. Only one-fifth were actively researching when they decided to buy the product. Just as striking, more than half of the bank defectors would have purchased the same service from their primary bank if they had been given the option. While the world is going digital, banks that invest in people will retain competitive advantage. Unfortunately, many banks have decreased their investments in growing and developing their teams. Many are foregoing bringing on full time bankers, and investing in contractors; in the last year alone, the contract staff to FTE ratio increased from 26 percent to 43 percent. This is a move designed to cut costs and enable flexibility, but in many ways, this approach to cost savings can hurt more than it helps. The next generation needs bankers more than ever. Millennials have more student debt and anxiety about money than any other generation. Almost a full three quarters of millennials believe they will not have the option to comfortably retire, and a similar percentage doubt the current retirement planning tools will enable them to achieve the savings they’ll need to be secure. Rather than focusing on low cost, contract talent, banks should increase their investments in people, upleveling their skills, offloading routine tasks, and empowering efficiency and insights through technology. This is where investments in robotics, personalization, and customer experience all work together. By making the lives and jobs of your staff easier, and giving them customer data to leverage more effectively in customer interactions, your staff can truly claim their place as trusted advisor, and begin building loyalty with the next generation of customers. While banks are facing unparalleled competition, there is still considerable opportunity to provide invaluable, unique services to customers and prospects. By embracing automation, up-leveling the banking experience, investing in personalization, and empowering staff to become trusted advisors, banks can find new ways to drive loyalty and growth.